Danforth Bay Camping Resort appears to be a relatively new campground located in northeastern New Hampshire near the Maine border. What a wonderful place to stay! Although we stayed there for a week last fall, we didn’t want to leave. 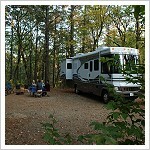 The campground has great facilities, well maintained and very clean. The staff is friendly, courteous and extremely helpful. The sites are really very spacious, and some have great views of the lake. There are some great pull-thru sites for larger rigs with just a short walk to the beach. Full hook-up with cable tv included! The property is well maintained and security is very visible at night. The campground has a well stocked store with a good supply of groceries and camping needs. The pool is fairly new and there were tons of activities when we stayed there last fall. You can rent boats, canoes, kyacks to use on the lake. Golf carts are also available to rent to drive around the campground. This is a great family-oriented campground. We plan on making reservations again for this fall. We went to Danforth Bay in June of 2007 in a 31′ fifth wheel. We were also very impressed with the cleanliness of the campground. Sites and restrooms were immaculate. Sites were very large and accomodating to big rigs. Roads are in excellent condition throughout the park. Lake area and beach is also nice. This is a huge campground. Would suggest bringing bikes or some other type of transportation to get around the park. We have plans to go back again in October and would definitely recommend this campground to everyone. The staff was extremely nice and helpful.